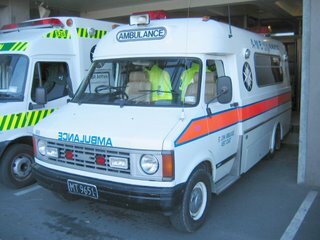 In my last year of my electrical training I had also become a volunteer ambulance officer (VAO) with the Auckland Ambulance service. Our official title was Honorary Assistant and we were the second crewmember on the ambulance, helping the full time Ambulance Officer (AO). It was an exciting and very different from the fire brigade. We completed a one-week Elementary Ambulance Aid course, which included learning how to administer oxygen, entonox (laughing gas), apply the 'Hare' traction splints for fractured femurs and use the stretchers and other equipment as well as basic first aid (bandaging, slings etc). We also learnt how to take a patients blood pressure and pulse and learnt about some of the common medical complaints and how to treat them. It was all a little daunting but I found it fascinating and therefore very enjoyable. Once I had finished the course I was initially rostered on either a 7-3 or 3-11 shift at a South Auckland station during the week or weekends and then eventually worked the week-ends and on-call for the night shifts for the local rural town ambulance. The work was varied and included attending car accidents, cardiac arrests, heart attacks, strokes and even a home birth. I really didn’t know what I was doing most of the time so I just ended up providing reassurance by talking to the patient and completing the dreaded paperwork. Some of the full time staff were vehemently against volunteers whom they perceived as a form of cheap labour. Their argument was that using volunteers for free labour prevented the service from having to provide full time, permanent personnel for double crewing all the vehicles at all times. This attitude was understandable to some degree, as they perceived it as a safety issue. Unfortunately a small minority of staff transmitted this attitude in their appalling behaviour towards the volunteer staff that they worked with. Being on the receiving end was quite unpleasant and included being blatantly ignored in front of patients, being be-littled or having condescending remarks made in front of the public, being deliberately unhelpful and even being blatantly downright rude. One particular officer I worked with considered me simply as an extra pair of hands to lift the end of the stretcher and that was it. He would snap at me in front of patients and therefore make me reluctant to ask for help or guidance. I would often think twice about turning up for duty if I was rostered on with him. I remember attending a job with a one of these officers in my early days. The callout involved a collapsed female patient in the main street of town. The patient appeared intoxicated and after only momentarily examining her, the ambulance officer walked off to the lotto shop next to where the patient was, to buy a ticket cursing that the callout was a waste of time. I was flabbergasted, as were the on-looking by-standers. Here an ambulanced had just turned out to a collapsed patient and one of the officers obviously couldnt give a damn! I was left standing there with this incoherent patient and really had no idea what I should do. I embarrassingly reassured the concerned public audience that it appeared that the patient was probably just drunk. In another bizarre incident with a different officer, we were called to a motor-vehicle accident in a rural outback road in the early hours of a weekend morning. A car containing some boy-racers had lost control and skidded into a ditch. On our arrival the occupants had managed to get out of the car but one patient had a small arterial laceration to his forehead above his left eye. The other passengers were holding a tee shirt on it to try and stop the oozing blood flow. Using some initiative I immediately grabbed the first response kit, which contained the dressings and bandages, but the grumpy AO snapped at me in front of everyone and ordered me to put it away. He then proceeded to fish in the open wound with a pair of non-sterile scissor clamps he was carrying and managed to clamp the small leacking artery. He then bandaged the clamp in place. Although it obviously stopped the bleeding it was a procedure I had never seen carried out before or since. It was certainly not standard procedure. Although these two particular gentlemen had many years of experience in the job and I’m sure had helped thousands of grateful patients, their attitudes towards their unpaid colleagues reflected that of someone burnt out from working in such a stressful environment for too long. Thankfully both of these staff members did not remain too much longer in the ranks and they soon moved to a less stressful occupation. Despite these minor setbacks it wasn’t long before I was hooked on the job and longed to be a full time ambulance officer. As a volunteer, I often worked twenty or more hours a week on top of my normal job, so apart from the urge to be employed in a more exciting occupation I was exhausted by the end of each week. Fate was to be on my side and I soon had my chance. I'd take an over eager volunteer over a burnt out / chip on the shoulder intensive care paramedic any day. Knowing what I know know i'd never ever put up with a bad attitude from a qualified officer. If they did display an attitude i'd pull out a tape recorder and my diary and ask them to clarify their position for the record. At the start of the day and at the end of the day it is about the patient. so agree with ya. Looking back on it they were really burnt out. Im surprised they had any empathy left in them! Still back then there was no counselling or anything and they saw plenty of crap to last them a lifetime! I'm keen to apply to St Johns to be ann AO can you give me any tips? I understand thay like you to be a volunteer first and you have to pass a fitness and strength test. My main concern is the strength test. Can you tell me how strong you need to be to be an AO?